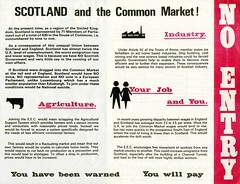 Burns Stamp, c.1956, originally uploaded by Scottish Political Archive. 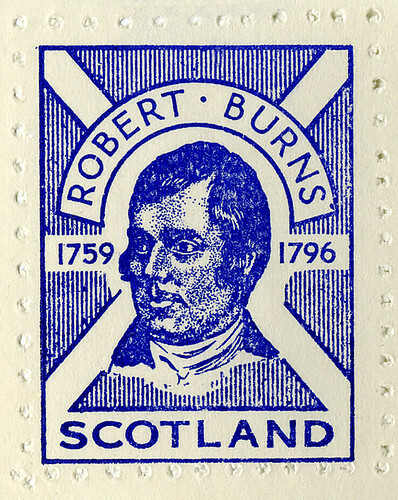 In 1956 the Burns Federation called for an official Burns stamp to celebrate the 200th anniversary of the Robert Burns’s birth. The Postmaster General refused to issue such a stamp as it would be “a significant departure from policy.” Insult was compounded to injury when the Postmaster General announced five stamps to commemorate the 400th anniversary of the birth of William Shakespeare. 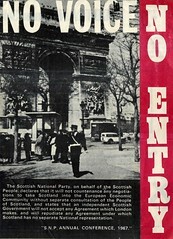 Many unofficial stamps were printed in response to this decree. 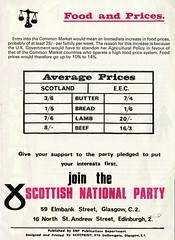 This stamp was issued by the Scottish National Party. The stamp was lithographed initially in maroon and designed by Wendy Wood. It is said that the perforated edges were run up on Wendy Wood’s sewing machine.